Stress and burnout are on the rise, as leaders and employees alike struggle to keep up with the relentless pace of business. But there’s another way. Arianna Huffington, founder of the Huffington Post, has turned to tackle work-life issues with Thrive Global, a media platform that seeks to improve both well-being and performance. In this interview with McKinsey’s Rik Kirkland, Huffington discusses how to disconnect from technology to reconnect with ourselves, as well as why supportive policies might help companies get ahead. The full and original article was published on People Lab. With so many factors in our lives playing a part in our mental health and well-being, it’s important to combat stresses in the workplace. After all, it is where we spend a large chunk of our time. The Mindfulness approach is all about being in the moment. It means being aware of how you think and feel about your experiences, good or bad. Why not take a break from your desk for five minutes, take the long way around to get a cup of tea and practice some deep breathing, clearing your mind and thinking of nothing else other than where you are going and how you like to make your tea. A problem shared is a problem halved. Asking how your team members (and each other) are getting on with a task can be great openers to finding out how they are feeling. Why not set-up a regular listening group, an open session that allows everyone to discuss what they think is going well, or not so well. Be fair and be positive, compile feedback and make some action points, and stick to them! Another little mindfulness tip, but getting out in the fresh air at lunch-time, or even for a ‘walking meeting’ with a colleague is a great excuse to break away from the office and the ‘stuff’ that keeps you there. It’s an easy way to refresh yourself, and get a bit of exercise while you’re at it too, happy chemicals (endorphins) are released to our brains when we exercise! Have you ever noticed that the constant checking of our email, phones, social media etc can make you feel on edge? A great tip, is to simply not communicate electronically until you feel ready to. Don’t check your email and voicemail every five minutes, make a list of priorities and cut yourself some slack! Fun at work? What is this sorcery? I’m sure most of us would agree it’s important to get on with those we work with, not just so we can complete our work easier, but to feel work is more than just work. Why not take ten minutes for a tea-break and play a small party game like pass the parcel (choose a small gift, work related or not) and get everyone on their feet and sharing a joke. I’m sure some posh biscuits would go down well too! 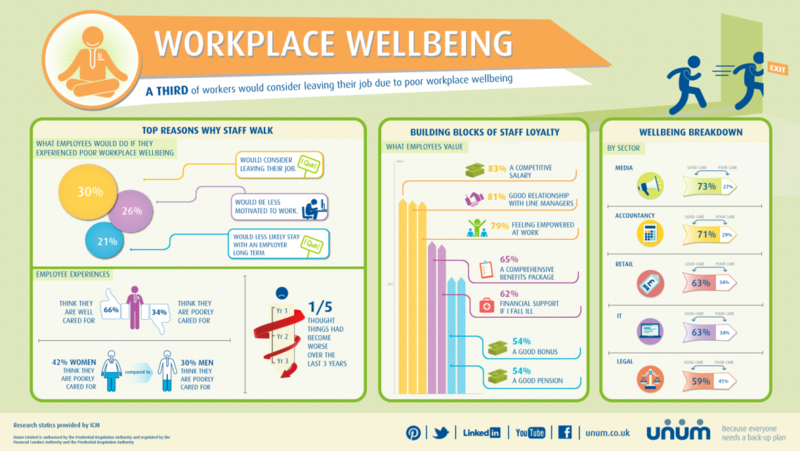 Employees' health affects productivity. But what to do when the problem is something they won't talk about?